Projects that are nearing completion or have recently completed. When we look at game design we think in terms of cracking particular problems. When discussing the design objectives for a new game someone might say, "I hate the way RPGs telegraph ranges to players by having a grid on the playing surface. There is no way the character would know the precise distance between themselves and a target!" But when you translate that into game design it raises all sorts of issues -- and those issues need to be cracked before the design is workable. As referee I want to be able to quickly and easily create an isometric map of an encounter location. I want that view to be of the highest quality, so that it can be printed and handed to the players and they will assume that it is a professional drawing. I want to be able to build that encounter location quickly and easily in-game using the modular terrain system. When the players see that 3D encounter location and place their figurines upon it, I want them to be able to compare back to the isometric map and recognize the location instantly. This really got us thinking. By the time the modular terrain system is complete it will contain hundreds of pieces. How then to generate those isometric views? We'll need a tool that will allow the isometric views of the individual pieces to be combined and assembled into an encounter location. That tool has to be easy to use - drag and drop, snap-to-edge kind of simple. It will need to allow for the labeling of rooms like any map. Save and print functionality. It sounds like a whole new project and a whole new product. There are a few tools out there that allow the referee to create attractive maps. The maps they produce are, by-and-large, top-down views rather than perspective views or isometric views. Of these mapping tools Campaign Cartographer 3 (CC3) from Profantasy Software is my favourite. While it has a beast of a learning curve it also has the most flexibility and raw power. It is hard to say no to raw power. Profantasy also produce the Cartographer's Annual. Each month a new symbol set and/or map template is produced, expanding the range of possible map styles for CC3. In Issue 66 of the Cartographer's Annual a symbol set and template was released that allowed isometric views of locations to be created. At left is one of the example maps supplied with the Annual. As soon as I saw this I thought to myself, "Outstanding!" Here was the tool -- drag-and-drop the symbols from the symbol library, snap-to-edge automatically handling the symbol alignment, save and print. A quick glance at the symbol set showed that there simply weren't enough symbols in the set to make isometric maps viable. Unfortunately, they quickly became repetitive. Not enough textures, not enough colours. Yet the functionality was there -- and that had to be the main issue to crack when it came to this design challenge. We knew we had the tool with the capability. Could we get illustrations created of the components of the modular terrain system? Could we convert those illustrations into CC3 isometric symbols? 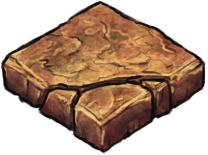 Could we integrate our symbols with the existing Isometric Dungeon CC3 catalogue? Lots of questions, but without those illustrations the rest of the questions were somewhat moot. We located Herwin -- the creator of the illustrations for the original Issue 66 symbol set. We asked whether he would help us with a proof of concept exercise. We wanted to send him a photograph of a cast. He would then create an isometric illustration of the cast. We would then attempt to create a CC3 symbol from the illustration. 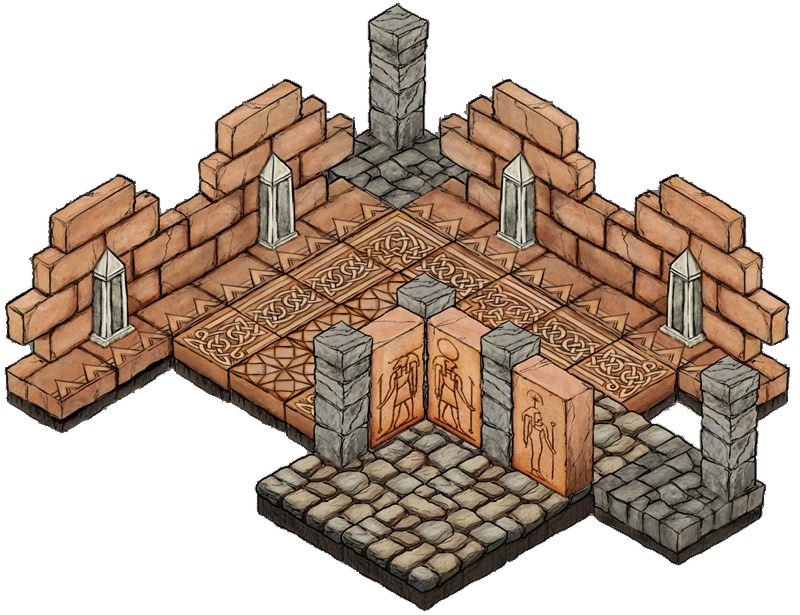 Finally, we would attempt to integrate that new symbol with the existing Isometric Dungeon symbols. Herwin agreed, the photograph was taken, and he responded with the illustration above. With the help of Ralf at Profantasy Software we eventually nailed down the process for creating the symbols from the illustrations. It wasn't easy and it wasn't swift but it was at least possible. Having created the test symbol we confirmed that it worked within CC3. As a last step in the proof of concept process we finally produced an integrated sample map, where symbols from Issue 66 of the Cartographer's Annual were combined with our symbol to create a single map. This map is shown at left. There are a couple of obvious issues here. 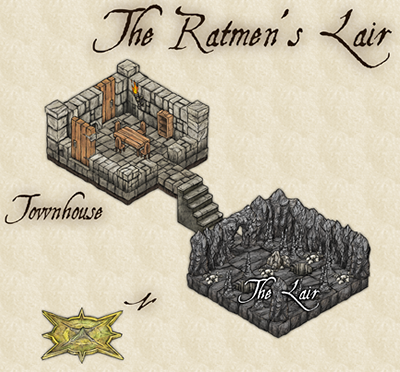 For example, our symbol has a different depth to the Isometric Dungeon symbols. Nevertheless, as a proof of concept exercise we were able to demonstrate that the process was workable. 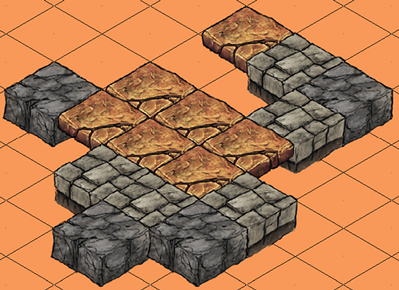 Herwin is now working on a complete catalogue of our modular terrain pieces. He has generated dozens and dozens of illustrations for us and there are many more to go. While Herwin works on this we will work on generating the symbols and building the symbol catalogue(s). There is no deadline for the completion of the project or the release of the subsequent product. Submissions from clients, customers, tournaments, and workshops.